Caterpillar has delivered the best full-year profit per share in its history, while registering higher sales volume and improved demand across all regions and three primary market segments in the December quarter. At $10.26/share, its profit for 2018 was way up on the $1.26/share it posted for 2017. On top of that, the company is predicting this number will increase again in 2019, with an outlook range of $11.75-$12.75/share. Cat’s 2018 sales and revenue came in at $54.7 billion, compared with $45.5 billion in 2017, while adjusted profit was up at $11.22/share (2017: $6.88/share). Total sales and revenue was $14.342 billion in the December quarter of 2018, a $1.446 billion year-on-year increase, with higher sales volume driven by improved demand across all regions and in the company’s three primary segments, Cat said. In the company’s resource industries segment, total sales were $2.797 billion in the December quarter, up $489 million on higher demand for both mining and heavy construction equipment, including quarry and aggregate, the company said. 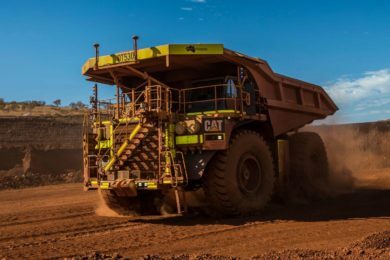 “Mining activities were robust as commodity market fundamentals remained positive, and increased non-residential construction activities drove higher sales,” Caterpillar said. Resource industries’ profit was $400 million in the most recent quarter of 2018, compared with $210 million a year earlier. The improvement was mostly due to higher sales volume and favourable price realisation, partially offset by higher material and freight costs, the company explained. Despite the company predicting another record profit per share in 2019, Umpleby said its outlook assumed only a “modest sales increase” based on the fundamentals of its end markets as well as “the macroeconomic and geopolitical environment”. “We will continue to focus on operational excellence, including cost discipline, while investing in expanded offerings and services to drive long-term profitable growth,” he added.